I haven’t posted anything in a while, I know. I think I have a legitimate excuse though! In the past two weeks, I've moved out of Mexico, travelled to the Netherlands, found a new apartment in Leiden (30 miles south of Amsterdam), and started a new job. Here are the details, arranged by the questions I’m guessing you may have. "Ok, wait. What exactly happened in the past two weeks?" Let’s start the story off on August 22 – a day like any other in San Pancho, Mexico. I was working in a local café, perusing the Internet for interesting, remote freelance work (my “Fun Productivity” hour). Turns out, more and more businesses these days are looking to outsource tasks and projects to knowledgeable, flexible, and cheap freelancers. Most freelancers work remotely, but I always checked the “willing to travel” box in my profiles. When all your possessions fit into a backpack, it’s very easy to be geographically-agnostic! I didn't take a picture of the cafe, so this random road will have to suffice. This is Calle America Latina, right past Taqueria Arbolitos. Anyways, one of the last things I did before finishing off my iced latte and banana bread was email my cousin Shawn. I knew he’d done freelancer-esque work in the past, such as building websites, and I wanted to see if he had any advice for me . . .
Meet my cousin Shawn. I think this picture was taken somewhere in Europe or Asia. Shawn emails me back after returning from a vacation. He gave me some good pointers and ended the email by asking if I had any interest in a short-term project in the Netherlands. I write back. “Definitely interested.” Why not? I remember this vividly. I was in Entre Amigos helping a couple colleagues plan a new walking tour around San Pancho. After we finished, we were chatting, when one of them asked how long I was going to stay in San Pancho. “Not sure,” I responded. “In fact, there’s a chance I could go to Europe soon, but I don't know when exactly.” A couple seconds later (I’m not exaggerating here), a notification popped up on my phone from Delta: I had a new round-trip ticket to Amsterdam, from Puerto Vallarta, departing at 8am that Thursday. I double-checked the current time: it was 2:38pm on Monday afternoon. “Whoa, wait. Looks like I’m going to Europe on Thursday” I told my friends in a state of shock and disbelief. They were as bewildered as I was. Later that afternoon, I emailed Shawn back. The round-trip ticket had me coming back to Puerto Vallarta on Tuesday, as he planned to spend the weekend showing me the project and then give me some time back home in Mexico to think it over. “Could we just make the round-trip a one-way?” I asked. I loved San Pancho, especially the people, but I didn’t want to end my planned world travels on the first stop. I figured if the project didn't work out, I could just explore the Netherlands on my own or go to another European country. “Sure thing," Shawn replied. "Just tell people you’re traveling around the world the other way." I frantically tried to say good-bye to all my San Pancho friends, reassuring them that I would come back (and I plan to, soon.) Reactions were all the same: amazement / confusion / shock about my trip, then an outpouring of love and thanks. I had heart-to-hearts with a lot of people (turns out you can have “heart-to-hearts” even if one person – me – isn’t that great with the language). I won’t get into all the details, but the main reason I chose to stay in San Pancho wasn’t the beach, nor the sun, nor the food. It was the people. I made lifelong friends with some of the nicest, kindest, most welcoming, funny people I’ve ever met. Everyone, and I mean everyone, said I could stay with them when I came back. “You are part of our family now” was a common phrase I heard. I feel very blessed to have met such wonderful people, and I thank them for everything they did for me, and the kindness and respect they treated me with. One family even stopped by the last night to wish me safe travels and to give me a note and some chocolates! And earlier that day, one of my best friends had taken me to a private beach in her village with some friends and family. The private beach I visited with some friends on my last day in San Pancho. Se llama (It's called) Punta Monterrey Beach, located a couple miles west of Las Lomas, Nayarit, Mexico (an even smaller town than San Pancho, about 10 miles north). Ramon, Marychuy, and me at the beach! I tutored both of them in English, and they helped me with my Spanish. Great, lifelong friends. Travel day! My friend Felipe – the owner of the local gym – graciously drove me to the Puerto Vallarta airport at 5:50 AM (an hour's drive), and Paula woke up to give me a hug and see me off. After a couple layovers, I arrived in Amsterdam, Netherlands the morning of September 2 and took a train 30 minutes south to Leiden. 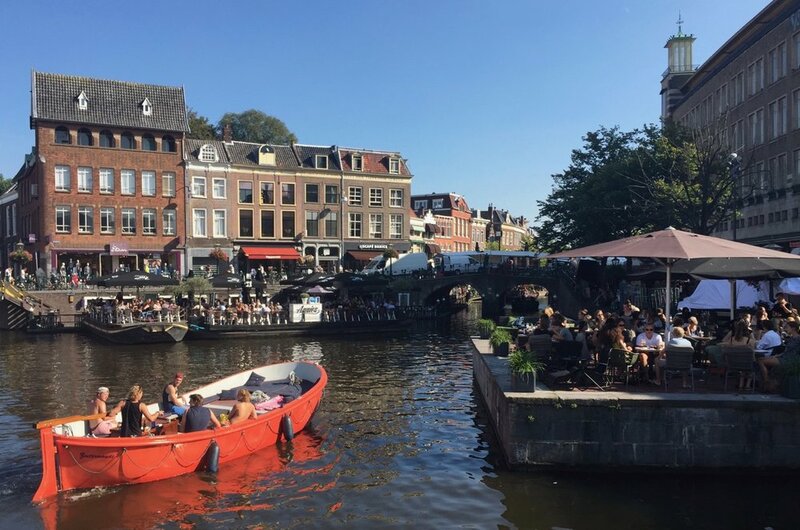 I’ll get into more details about Leiden in future posts, but for now, just picture it as “mini-Amsterdam.” It’s got all the charm of Amsterdam – the windmills, canals, cafes, bikes, tulips, etc. – with about 15% of the geographic size and population. I accidentally hit some sort of "Enhance" button when I was cropping this and it gave the picture a cool effect. Leiden Central, the train station. Over the course of the next two weeks in Leiden, I found an apartment, met the people I’d be working with, and started up my new job. Everyone speaks Dutch here, but I don't plan on trying to become fluent. More details about all these things will come in future posts, though. For now, I’ll address a couple more questions you may be thinking . . .
“Whoa, whoa, whoa - you got a job?? You're a sell-out! A phony!" Ok, totally fair. But let me clear up a couple things before you grab a pitchfork and buy a ticket to Leiden. First, I don’t have anything against traditional jobs. One of the reasons I was able to take this journey was thanks to my corporate consulting job, after all. My beef with traditional jobs more relates to the "why" as opposed to the "what." Put another way, I believe it's very easy - and comforting, since everyone else does it - to jump onto the corporate ladder and start climbing. However, if the reason for doing so is external (money, title, respect, etc.) as opposed to internal (happiness, intellectual curiosity, fun), there's a strong possibility that when you finally reach the top, you realize you were climbing the wrong ladder. Worse yet, you've used up the most healthy, flexible, and energetic years of your life during the climb - and there's nothing you can do to get them back. I did love it. The people, as I said, were truly amazing. I had a blast learning Spanish, teaching English, and hanging out with friends and (Mexican) family. I told people I plan to return soon, and I do. In fact, one of the first things I did in Leiden was find a Spanish tutor! “Hey wait, you only made it to 6pm in your 'Average Day in San Pancho' series!" Damn! I was hoping you’d forget! Nah, totally joking. I have a couple more Mexico stories I’d like to share, including what I did after 6pm, and these will be my next 2-3 posts. After that, I'll switch to Leiden stories. That’s all for now. There are stroopwafels to be eaten and windmills to be gazed at! PS. Here's the new map of my journey. You can always find the most updated one here.